Greetings from SQLSaturday in Vancouver, Canada! 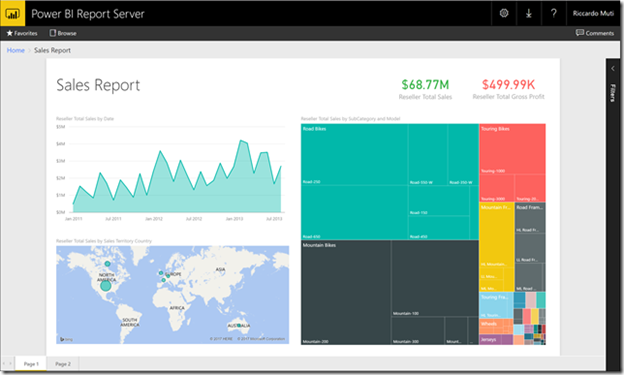 Today, we’re excited to release a preview of the next version of Power BI Report Server. This preview release contains some great new self-service BI capabilities, including support for data sources other than SQL Server Analysis Services and viewing and interacting with Excel Workbooks. Download Power BI Report Server August 2017 Preview! The June 2017 version of Power BI Report Server gave users the ability to create and publish Power BI reports on-premises by connecting to SQL Server Analysis Services data sources. Since then, we’ve heard repeatedly from customers about their need to publish Power BI reports created against other data sources and are pleased to give you an early preview of our progress. With this August 2017 preview, users can create Power BI reports in Power BI Desktop that connect to any data source, and publish their reports to Power BI Report Server. There's no special configuration required to enable this functionality — simply install and configure the August 2017 preview version of Power BI Report Server on your machine, and you’re ready to go. You can then use the included Power BI Desktop application to connect to your data source(s), create your report, and publish it directly to the report server to share it with your users. Scheduled data refresh is currently not available for reports using imported data. Direct Query data connections are not currently supported. Scale-out environments for Power BI Report Server are not officially supported using the preview release. Reports must be smaller than 50 MB in size. Excel and Power BI contain a portfolio of tools that is unique in the industry. Together, they enable business analysts to more easily gather, shape, analyze, and visually explore their data. In addition to viewing Power BI reports in the web portal, business users can now do the same with Excel workbooks in the new version of Power BI Report Server, giving them a single location to publish and view their self-service Microsoft BI content. Have no external data source dependencies. Have a live connection to an external SQL Server Analysis Services data source. Have a PowerPivot data model. To learn about these and other new features in the August preview, including support for the new table and matrix visuals, make sure you read the release notes and supporting documentation we’ve published to the Power BI website. We’re looking forward to hearing your feedback in the comments below or in the Power BI forums.